Suzdal is a destination for those in search of the real Russia. If you happen to be in Moscow and have a free day, then make the effort and take a trip to Suzdal – the ancient town is only 137 miles away. As visitors approach Suzdal, the intensity of its “Russian soul” begins to increase. In the village of Pavlovsk there is a small hotel with a yard containing an enormous structure in the shape of a mighty Russian warrior triumphing over a many-headed, fire-breathing dragon. The closer to Suzdal, the thicker the advertisements are for hotels, inns and restaurants. Almost the entire life of this town revolves around tourism today. The first record of Suzdal in the chronicles dates back to 1024. Suzdal sits on the picturesque banks of the winding Kamenka River, which flows through the entire town. In ancient times this river was navigable, as well as a principal trade route. In the early 12th century, under the rule of Prince Yuri Dolgoruky, Suzdal was the capital of the Rostov-Suzdal principality. Moscow, incidentally, was founded by Yuri Dolgoruky to protect the southern borders of this principality. Later Suzdal became the capital of the Suzdal-Nizhny Novgorod principality, and in 1392 it became part of the Grand Duchy of Moscow. Such historic activity could not but help influence Suzdal’s cultural development. In its day, Suzdal was the spiritual center of Old Russia, and this is evident even now. Over an area of 3.5 square miles there are five monasteries, some 30 churches and chapels and 14 bell towers: more cultural artifacts per square foot than anywhere else in the world, with the possible exception of Old Jerusalem. Buses leave every half hour for Suzdal from Moscow’s Shchyolkovsky Station. The cost of a ticket is about $5 and the journey takes around 4.5 hours. There are no high-rise buildings to be seen here, as they are prohibited by law. The tallest buildings are five stories – but if you do not know where they are, then you will not see them. The best place to begin a tour of the town is the market square. Its long, columned arcade ends in a spire with a weathervane in the shape of a falcon – the town’s ancient symbol. The Resurrection Cathedral completes the ensemble. Here, everything looks as it did 100-200 years ago, not counting the stands selling souvenirs. The square is paved with rough cobblestone over which it is not very easy to walk. High heels should be avoided on a visit to Suzdal. When setting off for Suzdal, remember that the museums all close at 6 p.m., as do the souvenir stands. After that, the town becomes completely peaceful and tranquil. Evening in Suzdal is a time for those who really love all things ancient. You can take a stroll on the quiet streets, surrounded by historical buildings and beautiful nature. Turn away from the market square toward Kremlin Street to find a hill on the right with a beaten path. It is not easy to climb this hill – especially in wet weather – but determination will be rewarded. From the top of the hill there is a marvelous panorama. This is an ideal vantage point for amateur photographers. There is a winding river, fields and a forest in the distance – real Russian nature. From here, two monasteries and ten churches can also be seen. But be careful, because scrambling down this hill is even harder than scrambling up. 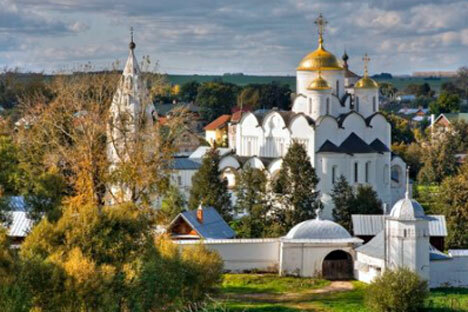 Suzdal’s Monastery of St. Euthymius is included on UNESCO’s list of World Heritage sites. This monastery was founded in 1352, on a high cliff overlooking the Kamenka River. The original walls were made of wood but, during the Polish-Lithuanian invasions in the 17th century, they were burned to the ground. After this, a genuine stone fortress was built, and it stands to this day. Inside the monastery there are several museums. The grave of Prince Dmitry Pozharsky can also be found here. Pozharsky, together with the Nizhny-Novgorod merchant Kuzma Minin, headed up the Second National Army and liberated Moscow from Polish invaders in 1612. Every hour on the hour, the monastery’s church bells treat visitors to a five-minute concert. On emerging from the monastery grounds, turn right and walk to the end of the fortress wall: here, visitors have another commanding view of Suzdal. A night spent in a tent is, of course, wonderful, but not particularly necessary. In Suzdal there are many hotels, large and small, to suit any taste and budget. Local residents also try to earn a little money on the side by renting out rooms to tourists. Suzdal boasts four historical complexes that are included on UNESCO’s list of World Heritage sites. In addition to the Monastery of St. Euthymius, there is the Suzdal Kremlin, the Cathedral of the Nativity, and the Church of Boris and Gleb in the village of Kideksh, just 3 miles away. Almost all of Suzdal’s churches and historical monuments are open to the public, while the town itself is a cultural preserve. A visit to the Suzdal Museum of Wooden Architecture comes highly recommended. The museum itself is a sort of small village located on the edge of the town, on a bank of the Kamenka River. It is an open-air exhibition of 18th- and 19th- century wooden buildings brought in from all over Russia: everything from peasant huts to boyars’ mansions, windmills and the wooden Church of the Transfiguration, built in 1756 without using a single metal nail. The church can be seen from any high ground in Suzdal.